Back to Life Chiropractic Centre was opened in 2006 by husband-and-wife chiropractors Dr Glen Cameron and Dr Julia Vitali. 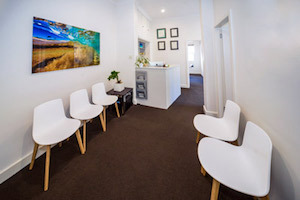 With a convenient location next to Westfield Shopping Centre, you can quickly reach our clinic from anywhere in the CBD and Eastern Suburbs region. We’re an easy stop for office workers before, during or after the workday and see many people working desk jobs who have common issues such as sciatica, low back pain, shoulder pain and headaches. Others we see have problems sustained at the gym or boot camp. All ages and types of conditions are welcome at our modern, sophisticated, and always friendly practice. Our chiropractors also offer workplace ergonomic assessments to make sure you’re ideally set up during the day to complete your duties while protecting your health. At Back to Life Chiropractic Centre, we believe that your healthcare should be your decision. Our chiropractors will offer their recommendations, and it’s up to you how you’d like to proceed. We don’t require you to sign up for a long-term care plan, though you’re welcome to visit us whenever you’d like so that you may feel better and maintain your health. Health fund coverage can be used for your appointments, and HICAPS are on-site for immediate processing. Schedule your time with us today!